The Powerheart G3 Pro AED from Cardiac Science is one of the industry’s best-selling professional automated external defibrillators. With launch of the new site, important information about the AED can be found in one place. PowerheartG3Pro.com was launched to provide potential buyers of the Cardiac Science Powerheart G3 AED enough information to make an informed purchase. The site does more than just provide information about the AED. It contains background information of the company that manufactures the AED – Cardiac Science. What is my liability if I use the AED? 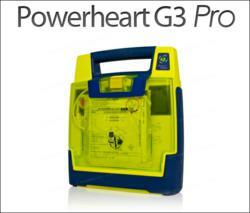 What is the useful life of a Powerheart G3 Pro AED? Who can help my facility with the implementation of an AED program?